Being able to study her passion in a state she loves has been a dream come true for Hadspen resident Febey Peace, thanks to the Inaugural David McEwan Scholarship in Agricultural Science. The University of Tasmania student, 23, is studying a Bachelor of Applied Science: Agriculture and Business, something that allows her to combine her love for science, nutrition and a healthy lifestyle. “I love consuming fresh produce and enjoy knowing where it comes from. Studying agriculture enables me to learn about all the processes involved in bringing food and drink products from the farm to the table,” Febey said. “I have always loved science. There are so many diverse options at UTAS to expand on a love of science, so I didn’t feel like I needed to move to mainland. “I studied and played soccer for two years in the United States of America where I particularly enjoyed units in environmental science, microbiology and food and nutrition. Febey travels to Hobart each week to study at the Sandy Bay campus with one unit at the Newhnam campus and some available online. Thanks to the scholarship, Febey reduced her casual work hours to put more focus on study. “Living in the north and travelling to the south each week for tutorials and practicals is very expensive. The scholarship helps cover my fuel and accommodation expenses, as well as items like textbooks and lab equipment,” she said. Scholarship donor David McEwan, is recognised for his life-long contribution to Tasmanian agriculture and the Australian wool industry. “I was very happy when I found out I was going to receive the scholarship. After learning about Mr McEwan I felt very proud and honoured,” Febey said. While career aspirations are still to be decided, Febey is keen to teach the future generations the importance of agriculture. “It’s very hard to choose which area interests me most, and I find myself changing my plans each time I take a new unit because it is all so interesting and important,” she said. “I am keen to get any hands-on experiences in the next two years to expand my options. 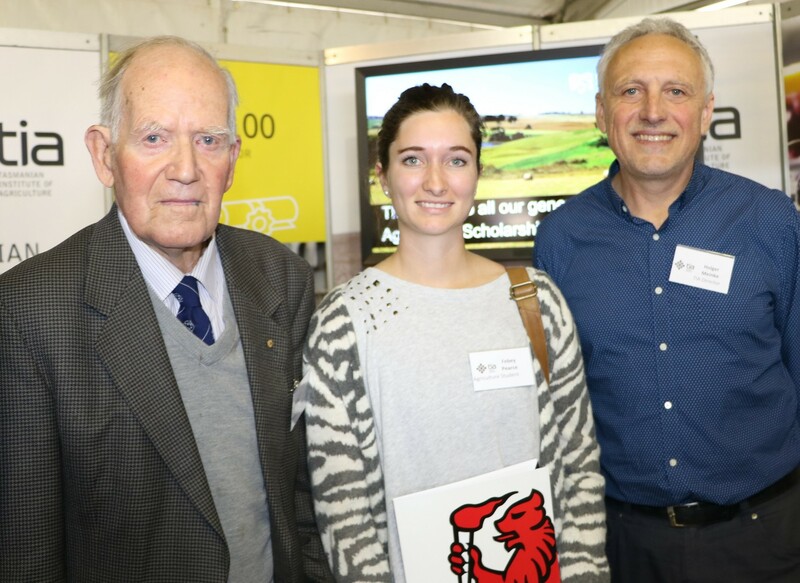 Image: University of Tasmania student Febey Pearce, 23, of Hadspen, was presented with the inaugural David McEwan Scholarship in Agricultural Science by retired farmer David McEwan (left), of Longford and Director of the Tasmanian Institute of Agriculture Professor Holger Meinke (right) at Agfest in May this year. Febey was one of 13 students from across Tasmania to be presented with scholarships to study agriculture at the University.